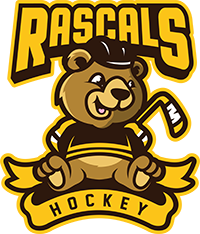 Our Summer Rascals Learn to Play Hockey Program is the largest Learn to Play Hockey Program in Western Canada. The Rascals program features a fun environment where kids are challenged with games and drills according to their rascal grouping. The players are placed in smaller groups on the ice with kids of a similar skill level so that everyone gains confidence and can interact with each other at a similar level. Not only do kids grow their hockey skills, but they also make tons of new friends, develop their social skills, grow confidence, and, of course, have a ton of fun. The program runs on Mondays in the summer and there are no early morning ice times or inconvenient hours. So what are you waiting for? We hope to see you out on the ice this summer. Rascals Level 1-4 is our entry level for beginner players. Rascals Level 1-4 is our entry level for beginner players. The focus of this program is to combine learning to skate and learning to play hockey. Players must be able to stand and glide forward on the ice to participate in the program. Full hockey gear is required. We recommend that players complete at least 3 skating levels prior to registering. This clinic will be split into 3 sections based on skill and experience level.